More than 1,500 people across three townships in northern Rakhine State have been displaced by fighting between the Myanmar military and Arakan Army (AA) since clashed broke out in October, according to local civil society groups. Lawyers acting for two Reuters reporters jailed for breaching the Official Secrets Act submitted seven reasons why the pair should be acquitted at an appeal hearing at Yangon Region High Court on December 24. In order to fight illegal trade, Myanmar has been increasingly seizing illegally imported products through border routes. Parliament Public Accounts Committee member Than Soe (Economics) said that the intervention of the Central Bank in the market by buying US$34 million within two days at the rate of 1,570 Kyat per dollar had an impact on the market. Myanmar earned over US$495 million from over 1.4 million tons of rice and broken rice export from April to November in this year, according to Myanmar Rice Federation (MRF). Ethnic cleansing, phase two, confronts the Rohingya Muslims of Myanmar who were victims of a brutal uprooting beginning in August 2017. Telenor Myanmar has announced that its 4G/LTE network now covers more than 300 townships, which is 90% of the whole country. In September, Telenor set an ambitious goal of bringing 4G/LTE network to 300 townships by the end of the year. ‘Rakhine local social organizations have provided things to those IDPs. I don’t think they will be able to provide things for next wave of IDPs,’ a social worker said. Despite ethnic armed forces getting on board with the Nationwide Ceasefire Agreement (NCA), they are still unable to set defined territories such as ceasefire areas and controlled areas. These are the big challenges of peace process according to Joint Monitoring Committee at Union Level Secretary (1) Dr. Shwe Kharr. Negotiators have expressed hope that the military’s decision to halt operations in Shan and Kachin states for four months can resuscitate deadlocked peace talks. The Ta’ang National Liberation Army (TNLA) issued a statement saying that they fought with Tatmadaw (government troops) just three days after the Tatmadaw issued a statement saying that they would ceasefire in five regional command areas to allow peace talks. The bullet-riddled body of a Myanmar policeman was found in northern Rakhine state, government media said Sunday, as tensions rise in the hotspot where the Rohingya crisis erupted last year. A member of the Arakan National Party (ANP) was arrested in Yangon on Dec. 15 in connection with the murder of a military intelligence officer and is in poor health after four days of interrogation by the Military Security Affairs Unit, according to a friend and a relative. 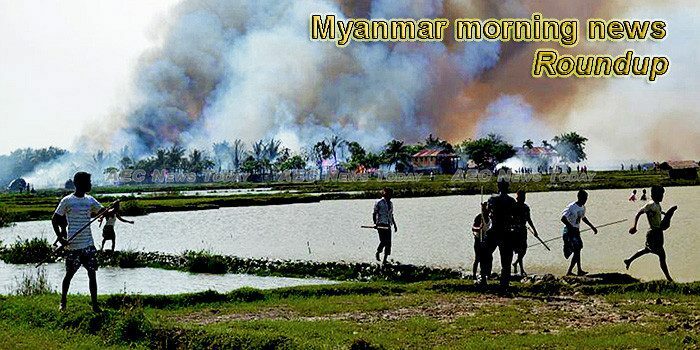 Arakan Army (AA) and government military troops were fighting fiercely in Rakhine State and the AA said that the government military had used helicopters in attacking them. Positive news came at the end of the year with the military’s announcement of a temporary ceasefire effective in conflict areas in the north and northeast of Myanmar which prompted notes of welcome from some ethnic leaders and observers. More than 1000 Pa-O people staged a protest over the death of five Pa-O ethnic nationals by RCSS/SSA in Loilin. These five Pa-O were allegedly killed by an attack from RCSS/SSA, prompting this protest that demanded justice for their fallen brethren as well as safe and secure lives for the rest of the people. The effort aimed at promoting mutual trust between the defence forces of Myanmar and India is part of the latter’s strategy to counter increasing Chinese influence in the Indian Ocean region. Afraid of stepping on mines, locals in the Tanintharyi township are opting not to harvest their areca nuts. Locals in Tanintharyi’s Yephyu Township have said they are afraid to harvest crops due to recent landmine explosions in the area. State Counsellor Aung San Suu Kyi attended the ground breaking ceremony of Myanmar-Korea Friendship Bridge (Dala) on December 24. The construction of the bridge has begun and people from Korea will be constructing the bridge. The Karen community have officially opened what they call the Salween Peace Park in Karen State in order to protect the region’s environment. The park was officially opened on 18 December. Mon State legislative assembly deputy speaker Dr Aung Naing Oo said the Union Parliament had a plan to amend laws enacted by States/Regions legislative assemblies and they would be amended only after collecting the opinions of local assemblies. Lower House of Parliament has approved the proposal calling for projects for the development of life of ethnic nationals living in undeveloped rural areas. The motion, submitted by Lower House MP Ar Moe Hsi for Khaunglanphu Constituency, was approved during a parliamentary session of Lower House held in Nay Pyi Taw on December 19. The Federal Political Negotiation and Consultative Committee (FPNCC) issued a statement on December 23, mentioning that the statement on ceasefire and eternal peace released by Tatmadaw (defence services) was totally supported as it is a crucial step toward peace process. Authorities are trying to expose and arrest counterfeiters as they know where fake K10,000 notes come from and which numbers are fake, said President’s Office spokesperson Zaw Htay. President Office spokesman Zaw Htay said that they had adopted policy and guidelines for shifting the General Administration (GA) Department to put it under the Union Government Office Ministry from the current Home Ministry. The Indo-Myanmar Manipur Business Matching Investment Conference and Exhibition is being held at Mandalay Region Chamber of Commerce and Industry (MRCCI), in Mandalay. The amount of money sent by migrant workers through legal channels has reached K39 billion during the period from January to August 2018. The average inflation rate, based on the Consumer Price Index (CPI), increased to 6.66 per cent in November from 6.34 per cent in October, according to a recent report issued by the Central Statistical Organization (CSO), under the Ministry of Planning and Finance, state media reported. MSH, which previously owned 92 per cent in the company, has taken over MS English, which holds the rights to the Wall Street English franchise. Recognizing those who sacrificed their lives for changing political system form an important component for national reconciliation, said Ko Ko Gyi, Chairman of People’s Party. The remarks of Ko Ko Gyi, one of the 88 Generation political figures, came from the ceremony to commemorate the 25 anniversary of the death of former colonel Sein Mya at Dhama Piya Monastery in Thingangyun Township on December 23. The Myanmar Aerospace Engineering University was selected among participants from 182 countries as this year’s winner of the Energy Globe Award in Japan. Scholarships funded by a foundation with historic links to Myanmar have been turning dreams into reality for deserving students for 25 years. Authorities are planning to reduce teak and hardwood production by 2019-20 FY, said Ohn Win, Union Minister for Resource and Environmental Conservation on December 21. The union minister said the respective state and region governments should provide help to establish plantations in state owned land plots. All state and region governments need to supervise to ensure that laws, by-laws and rules and regulations are followed. Union Minister for Health and Sports said that there are many expired medicines in Myanmar at the ceremony of opening a clinic at the Ayeyar Express car gate in Hlaing Tharyar Township on December 23. The second Yangon City Christmas is underway in Yangon from December 23rd to 25th . It will be held at seven places in Yangon. Many vocalists including Zaw Paing, Bo Phyu, Aung Htet, Pho Pyae, Irin Zin Mar Myint, Lane Maw Thi, Jewel and Chan Myae Maung Cho will entertain at the Pyin Oo Lwin flower festival on Christmas Day. The mismanagement of the Yangon-Pathein highway has raised questions about build-operate-transfer contracts awarded to private companies by the former junta. The Ministry of Health and Sports has opened a clinic in the compound of Dagon Ayeya Highway Bus Terminal in Hlaingthaya Township, Yangon Region, to provide healthcare services for passengers and transfer emergency patients to hospitals. When Eric Trutwein discovered two decades ago that he was HIV positive, he returned to his Magway Region hometown to die. But his health improved, and he has built a new life through a guesthouse and a school for orphans. Scrutiny for Myanmar Academy Awards 2018 that started in the second week of this month will take about three months, said Aye Kyu Lay, secretary of the Academy award scrutiny board. Music concerts will be organized in major cities of Myanmar including Yangon and Mandalay on the night of New Year Eve with performances from top vocalists and bands. Hope, peace and despair were among the themes explored when Myanmar and foreign artists gathered in Yangon for the country’s second international performance art festival.